For other uses, see Pupil (disambiguation). The pupil is a hole located in the center of the iris of the eye that allows light to strike the retina. It appears black because light rays entering the pupil are either absorbed by the tissues inside the eye directly, or absorbed after diffuse reflections within the eye that mostly miss exiting the narrow pupil. The pupil is the central opening of the iris on the inside of the eye, which usually appears black. The grey/blue or brown area surrounding the pupil is the iris. The white outer area of the eye is the sclera. The central outermost transparent colorless part of the eye (through which we can see the iris and pupil) is the cornea. 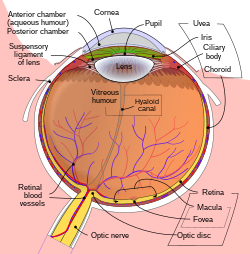 Cross-section of the human eye, showing the position of the pupil. In humans the pupil is round, but other species, such as some cats, have vertical slit pupils, goats have horizontally oriented pupils, and some catfish have annular types. In optical terms, the anatomical pupil is the eye's aperture and the iris is the aperture stop. The image of the pupil as seen from outside the eye is the entrance pupil, which does not exactly correspond to the location and size of the physical pupil because it is magnified by the cornea. On the inner edge lies a prominent structure, the collarette, marking the junction of the embryonic pupillary membrane covering the embryonic pupil. The pupil is a hole located in the centre of the iris of the eye that allows light to strike the retina. It appears black because light rays entering the pupil are either absorbed by the tissues inside the eye directly, or absorbed after diffuse reflections within the eye that mostly miss exiting the narrow pupil. The iris is a contractile structure, consisting mainly of smooth muscle, surrounding the pupil. 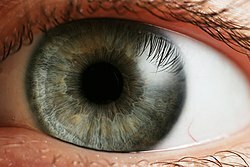 Light enters the eye through the pupil, and the iris regulates the amount of light by controlling the size of the pupil. This is known as the pupillary light reflex. The iris contains two groups of smooth muscles; a circular group called the sphincter pupillae, and a radial group called the dilator pupillae. When the sphincter pupillae contract, the iris decreases or constricts the size of the pupil. The dilator pupillae, innervated by sympathetic nerves from the superior cervical ganglion, cause the pupil to dilate when they contract. These muscles are sometimes referred to as intrinsic eye muscles. The sensory pathway (rod or cone, bipolar, ganglion) is linked with its counterpart in the other eye by a partial crossover of each eye's fibers. This causes the effect in one eye to carry over to the other. The pupil gets wider in the dark and narrower in light. When narrow, the diameter is 2 to 4 millimeters. In the dark it will be the same at first, but will approach the maximum distance for a wide pupil 3 to 8 mm. In any human age group there is however considerable variation in maximal pupil size. For example, at the peak age of 15, the dark-adapted pupil can vary from 4 mm to 9 mm with different individuals. After 25 years of age the average pupil size decreases, though not at a steady rate. At this stage the pupils do not remain completely still, therefore may lead to oscillation, which may intensify and become known as hippus. The constriction of the pupil and near vision are closely tied. In bright light, the pupils constrict to prevent aberrations of light rays and thus attain their expected acuity; in the dark this is not necessary, so it is chiefly concerned with admitting sufficient light into the eye. When bright light is shone on the eye, light sensitive cells in the retina, including rod and cone photoreceptors and melanopsin ganglion cells, will send signals to the oculomotor nerve, specifically the parasympathetic part coming from the Edinger-Westphal nucleus, which terminates on the circular iris sphincter muscle. When this muscle contracts, it reduces the size of the pupil. This is the pupillary light reflex, which is an important test of brainstem function. Furthermore, the pupil will dilate if a person sees an object of interest. If the drug pilocarpine is administered, the pupils will constrict and accommodation is increased due to the parasympathetic action on the circular muscle fibers, conversely, atropine will cause paralysis of accommodation (cycloplegia) and dilation of the pupil. Certain drugs cause constriction of the pupils, such as opioids. Other drugs, such as atropine, LSD, MDMA, mescaline, psilocybin mushrooms, cocaine and amphetamines may cause pupil dilation. The sphincter muscle has a parasympathetic innervation, and the dilator has a sympathetic innervation. In pupillary constriction induced by pilocarpine, not only is the sphincter nerve supply activated but that of the dilator is inhibited. The reverse is true, so control of pupil size is controlled by differences in contraction intensity of each muscle. Another term for the constriction of the pupil is miosis. Substances that cause miosis are described as miotic. Dilation of the pupil is mydriasis. Dilation can be caused by mydriatic substances such as an eye drop solution containing tropicamide. A condition called bene dilitatism occurs when the optic nerves are partially damaged. This condition is typified by chronically widened pupils due to the decreased ability of the optic nerves to respond to light. In normal lighting, people afflicted with this condition normally have dilated pupils, and bright lighting can cause pain. At the other end of the spectrum, people with this condition have trouble seeing in darkness. It is necessary for these people to be especially careful when driving at night due to their inability to see objects in their full perspective. This condition is not otherwise dangerous. The size of the pupil can be a symptom of an underlying disease. Dilation of the pupil is known as mydriasis and contraction as miosis. Not all variations in size are indicative of disease however. In addition to dilation and contraction caused by light and darkness, it has been shown that solving simple multiplication problems affects the size of the pupil. The simple act of recollection can dilate the size of the pupil, however when the brain is required to process at a rate above its maximum capacity, the pupils contract. There is also evidence that pupil size is related to the extent of positive or negative emotional arousal experienced by a person. The W-shaped pupil of the cuttlefish expanding when the lights are turned off. Not all animals have circular pupils. Some have slits or ovals which may be oriented vertically, as in crocodiles, vipers, cats and foxes, or horizontally as in some rays, flying frogs, mongooses and artiodactyls such as sheep, elk, red deer, reindeer and hippopotamus, as well as the domestic horse. Goats, toads and octopus pupils tend to be horizontal and rectangular with rounded corners. Some skates and rays have crescent shaped pupils, gecko pupils range from circular, to a slit, to a series of pinholes, and the cuttlefish pupil is a smoothly curving W shape. There are rare cases of humans with very unusually shaped pupils, such as peanut-shell-shaped pupils, as if the sides of the pupils are pinched together in the middle, like a vertical peanut shell, being wide at the top and bottom of the pupil, but narrow in the middle. There may be differences in pupil shape even between closely related animals. In felids, there are differences between small- and large eyed species. The domestic cat (Felis sylvestris domesticus) has vertical slit pupils, its large relative the Siberian tiger (Panthera tigris altaica) has circular pupils and the Eurasian lynx (Lynx lynx) is intermediate between those of the domestic cat and the Siberian tiger. A similar difference between small and large species may be present in canines. The small European red fox (Vulpes vulpes) has vertical slit pupils whereas their large relatives, the gray wolf (Canis lupus lupus) and domestic dogs (Canis lupus familiaris) have round pupils. One explanation for the evolution of slit pupils is that they can exclude light more effectively than a circular pupil. This would explain why slit pupils tend to be found in the eyes of animals with a crepuscular or nocturnal lifestyle that need to protect their eyes during daylight. Constriction of a circular pupil (by a ring-shaped muscle) is less complete than closure of a slit pupil, which uses two additional muscles that laterally compress the pupil. For example, the cat's slit pupil can change the light intensity on the retina 135-fold compared to 10-fold in humans. However, this explanation does not account for circular pupils that can be closed to a very small size (e.g., 0.5 mm in the tarsier) and the rectangular pupils of many ungulates which do not close to a narrow slit in bright light. An alternative explanation is that a partially constricted circular pupil shades the peripheral zones of the lens which would lead to poorly focused images at relevant wavelengths. The vertical slit pupil allows for use of all wavelengths across the full diameter of the lens, even in bright light. It has also been suggested that in ambush predators such as some snakes, vertical slit pupils may aid in camouflage, breaking up the circular outline of the eye. In a study of Australian snakes, pupil shapes correlated both with diel activity times and with foraging behaviour. Most snake species with vertical pupils were nocturnal and also ambush foragers, and most snakes with circular pupils were diurnal and active foragers. Overall, foraging behaviour predicted pupil shape accurately in more cases than did diel time of activity, because many active-foraging snakes with circular pupils were not diurnal. It has been suggested that there may be a similar link between foraging behaviour and pupil shape amongst the felidae and canidae discussed above. A 2015 study confirmed the hypothesis that elongated pupils have increased dynamic range, and furthered the correlations with diel activity. However it noted that other hypotheses could not explain the orientation of the pupils. They showed that vertical pupils enable ambush predators to optimise their depth perception, and horizontal pupils to optimise the field of view and image quality of horizontal contours. They further explained why elongated pupils are correlated with the animal's height. An anomaly of etymology is that in a surprising number of unrelated languages the meaning of the term for pupil is little person. This may be because the reflection of one's image in the pupil is a minuscule version of one's self. ^ a b Cassin, B. and Solomon, S. (1990) Dictionary of Eye Terminology. Gainesville, Florida: Triad Publishing Company. ^ a b Malmström T, Kröger RH (January 2006). "Pupil shapes and lens optics in the eyes of terrestrial vertebrates". J. Exp. Biol. 209 (Pt 1): 18–25. doi:10.1242/jeb.01959. PMID 16354774. ^ "Aging Eyes and Pupil Size". Amateurastronomy.org. Archived from the original on 2013-10-23. Retrieved 2013-08-28. ^ "Factors Affecting Light-Adapted Pupil Size in Normal Human Subjects" (PDF). Retrieved 2013-08-28. ^ Larson, Merlin D. (2008-06-01). "Mechanism of opioid-induced pupillary effects". Clinical Neurophysiology. 119 (6): 1358–1364. doi:10.1016/j.clinph.2008.01.106. ISSN 1388-2457. PMID 18397839. ^ Johnson, Michael D. (October 1, 1999). "How to spot illicit drug abuse in your patients" (PDF). California Society of Addiction Medicine. Retrieved March 22, 2018. ^ Hess, Eckhard H.; Polt, James M. (1964-03-13). "Pupil Size in Relation to Mental Activity during Simple Problem-Solving". Science. 143 (3611): 1190–1192. doi:10.1126/science.143.3611.1190. ISSN 0036-8075. PMID 17833905. ^ L. Andreassi, John (2006). Psychophysiology: Human Behavior and Physiological Response (Psychophysiology: Human Behavior & Physiological Response); 5 edition. Psychology Press. ISBN 978-0805849516. ^ "My Brain is Overloaded". prezi.com. Retrieved 2017-02-28. ^ Partala, T. & Surakka, V. (2003). "Pupil size variation as an indication of affective processing". International Journal of Human-computer Studies. 59 (1–2): 185–198. doi:10.1016/S1071-5819(03)00017-X. ^ Murphy, C.J. & Howland, H.C. (1990). "The functional significance of crescent-shaped pupils and multiple pupillary apertures". Journal of Experimental Zoology. 256: 22. doi:10.1002/jez.1402560505. ^ Roth, Lina S. V.; Lundström, Linda; Kelber, Almut; Kröger, Ronald H. H.; Unsbo, Peter (2009-03-01). "The pupils and optical systems of gecko eyes". Journal of Vision. 9 (3): 27.1–11. doi:10.1167/9.3.27. ISSN 1534-7362. PMID 19757966. ^ Walls, G.L., (1942). The Vertebrate Eye and its Adaptive Radiation. The Cranbrook Institute of Science, Bloomington Hills, Michigan. ^ Hughes, A. (1977). "The topography of vision in mammals of contrasting life style: comparative optics and retinal organisation", pp. 613–756 in F. Crescitelli (Ed. ), Handbook of Sensory Physiology VII/5., Springer-Verlag, Berlin. ^ Land, M.F. (2006). "Visual optics: the shapes of pupils". Current Biology. 16 (5): R167–8. doi:10.1016/j.cub.2006.02.046. PMID 16527734. Atlas image: eye_1 at the University of Michigan Health System — "Sagittal Section Through the Eyeball"
Atlas image: eye_2 at the University of Michigan Health System — "Sagittal Section Through the Eyeball"
A pupil examination simulator, demonstrating the changes in pupil reactions for various nerve lesions.